I'll be posting new work intended for Stricoff in a few days, but in the mean time I thought I'd revisit some older pieces that have now found a new home. These paintings will all be included in the Wynne/Falconer show in September. 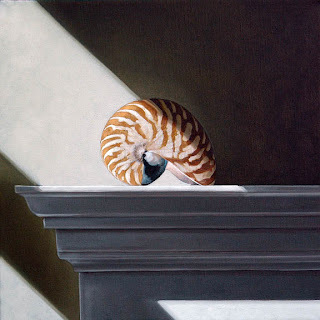 The Nautilus above is one of my current favorites. It was one of those paintings that just flowed. No cursing or frustration of any kind. It would be nice if all my work evolved so painlessly. Pre-show purchase information can be found by clicking here. Many of those who frequent this blog will remember the post where I lamented the lack of interest in this particular painting. As fortune would have it, Kenny Wynne agreed to accept it for the up-coming show along with "Chevrolet" (below). Well, one day after the current issue of American Art Collector hit the newsstands (see previous post) he received a call from a collector in Americas' southwest, and it sold. I don't know for a fact that it was seen in the magazine, but it would appear that this is the case. The power of advertising. I'm presently working on four new paintings for New York, and as I said above they will be posted (hopefully) in the next few days. This being the case I thought it would be an opportune moment to bring some attention to the remaining pieces in the Wynne/Falconer show. Four of the nine paintings have already sold in pre-show purchases, which is pretty cool. Plus it's always nice to have a few red dots to start off a show. 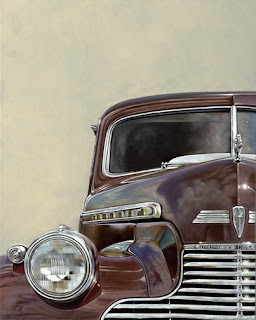 Anyone interested in a pre-show purchase of "Chevrolet" (above) can find gallery information by clicking here. American Art Collector - We're In! 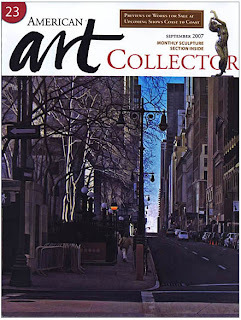 Well, the September issue of American Art Collector magazine has (finally) arrived. The publisher was kind enough to send Karen, and I two complimentary copies. Needless to say, we devoured them the moment we got them in the door. This was followed by much back slapping and high-fiving. It was a fun afternoon. I have to say that when I read the article I realized that I use the word "really" way too often. I'll have to work on that in the future. As we perused the magazine we were surprised to see a feature article on a friend of ours. His name is Caesar Santander. We've had a long-distance phone relationship with him for a quite a while now. Four or five times a year one or the other will call, and we'll discuss our careers, and art in general. We also spent a day with him in New York back in '05. Karen and I were cold calling galleries, and he (a resident of NYC) acted as our guide. With the exception of being rejected by twelve galleries, it was a good day. Had the best bowl of gazpacho I've ever eaten at a wonderful spanish restaruant. Pretty much the high-light of that day. I think Karen, and I will be riding the high of this article for sometime. I've placed it on my website, and I think the text is large enough to actually read. You can access it by clicking here. I'm getting away from the Wynne/Falconer pieces for a little while, and have decided to put up some of the work I've been doing for Stricoff in New York. I've been fortunate in that all of the paintings I've delivered to them so far have sold quickly. Realtively speaking. PB&J No. 5 was just shipped, and should arrive - hopefully - by saturday. This is one of six paintings I have in the works. The other five are in various stages completion. If I can keep myself motivated, I should be able to deliver these by the end of the month. If you have an interest in purchasing this piece you'll find contact information for the gallery by clicking here. I'll be posting images of the remaing paintings as they are completed. This is the sixth of the completed paintings for the show at Wynne/Falconer gallery. I think this falls into the "muted" palette category I wrote of in an earlier post. It was fun to do a larger reflective piece again, and really get the whole room into the image. 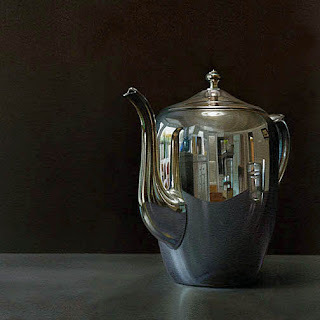 This kettle was on loan from Bob Deyber's collection of highly reflective items. He's got some really nice objects, and has generously offered me the loan of these for subjects of future paintings. If you are interested in purchasing this painting you can find gallery contact information by clicking here. The gallery has asked me to state to potential buyers, that any painting purchased prior to the show must remain in the gallery for the duration of the show. Well it's been one year since my first post. Hoorah! I wasn't sure at first if this endeavor would amount to anything, or just take up a lot of my time. I have to say, it's been a blast. The postive aspects of it have been numerous. First off, I think it has improved my painting in general. I thought, if I'm going to place images of my paintings up for everyone to see, I had better be creating work that I'm proud of. With that in mind I tend to work a little harder than I might other wise. The feedback from visitors is really important. In addition to the up-lifiting effect of positive comments, it helps me judge what is working, and what is not. A valuable tool. So, I'd like to thank all of those who took the time to remark on my paintings during the previous twelve months. Thanks. Another perk from having a blog is being a part of the blogging community. I've discovered so many new artists by following the multitude of links each site provides. The only problem with this is the addictive nature of visiting those links. It's really hard to stop. I'd like to add one more thank you to Belinda DelPesco who encouraged me to create a blog in the first place. She was very enthusiastic about her own blog, and easily convinced me to start one of my own. Belinda took the time to walk me through the particulars of creating a blog. Sparing me the time I would have had to spend figuring it out. I'd also like to send a word of thanks to Jeff Hayes who gave me the benefit of his extensive knowledge of the blogging world. These two artists were essential in the formation of my blog. So, Jeff and Belinda - Thank You! Above is the fifth of the finished paintings planned for the show at Wynne/Falconer on September 8th. 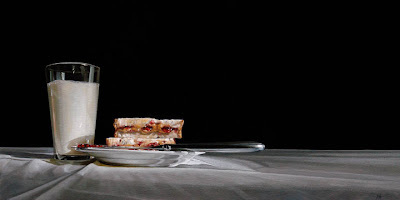 Peanut butter and jelly sandwiches are quickly becoming one of my most popular subjects. They're fun to paint, and I've got many more in the works, so I hope they continue to sell. If you are interested in a pre-show purchase of this paintings you will find contact information by clicking here. The gallery has asked to inform potential buyers that the painting must remain in the gallery throughout the duration of the show. Here is number four of the completed paintings for the show at Wynne/Falconer gallery in September. I've been tying to go for a slightly moodier look in some of my new paintings. Greying down the colors a bit, and producing a more somber piece. This is new for me, but it's kind of exciting. Here there is no direct sunlight, with its' stark shadows and brilliant highlights. 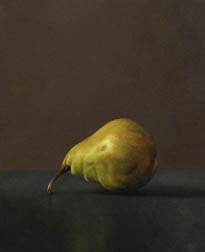 Just a single pear on a soapstone table top lit by the diffuse light of an overcast day. I think I'll throw one of these in from time to time, and explore the potential of a more muted palette. It's shameful how I've had this blog for nearly a year now, and as yet haven't devoted any space to the paintings of my wife Karen. Her work has an emotional quality that is hard to describe. Speaking for myself, and I've related this to her many times, I feel as though I can almost smell the salt air blowing in through the open window. I'm transported to these locations, which are very calming, with an occasional hint of melancholy. Her compositions are meticulously planned, and in my opinion her ability to portray light in oil, rivals any artist working today. Karen knew at an early age that she wanted to be an artist, and twenty years ago she began to realize that dream. I don't know anyone whose enthusiasm for art is greater than hers. She told me when we first met that my paintings had inspired her. I can honestly say, that I probably wouldn't be painting for a living now, had it not been for her encouragement, and infectious drive to paint. The painting above is one of the pieces she will have at the Wynne/Falconer show in September. We will be sharing the spotlight in a two-man show during that week on Cape Cod. Karen's been working hard preparing for this show, and will be presenting some of her best work to date. A number of these pieces will also be presented in the September issue of American Art Collector magazine. She has also started to branch out into the high-end print market. 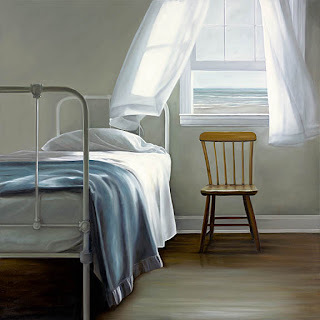 Karen has developed a relationship with Gallery Street an art reproduction company here in town, to create MasterpieceTM giclees of specific paintings. The people at Gallery Street have worked very hard to match the subtle colors of Karen's paintings, and I have to say that the quality of these prints is quite amazing. Karen and I color proofed the reproductions along side the originals, and they are a spot-on match. Karen will be offering the prints from her website in these initial stages, with plans to offer them to select galleries around the country in the future. If you're not familiar with Karen's work, you should take some time and visit her website. I think you'll find it time well spent. This is number three of the completed paintings for the show at Wynne/Falconer gallery in September. 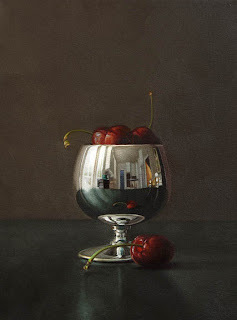 Cherries are a popular theme for me, as is the reflective, so I thought I'd combine the two, and see what happens. I came across four of these little silver goblets at a flea market/antique store not long ago, and fell in love with their shape. I think they will be showing up regularly in future paintings. If you'd like to purchase this piece in a pre-show sale you can contact the gallery by clicking here. The gallery has asked me to state in these postings that any painting purchased prior to the show must remain in the gallery throughout the duration of the show.